DONCASTER’S biggest railway bridge is to carry the name of the borough’s most famous railway engine. Signs carrying the name Malland Bridge have been unveiled as it was announced the giant structure carrying White Rose Way across 17 railway lines would be named after the locomotive which set the steam speed record 75 years ago, and still holds it. It forms part of the Doncaster Southern Gateway Improvement Scheme, which is converting the road linking Doncaster with junction three of the M18 into a dual carriageway. Motorists used the bridge for the first time in October 2012. 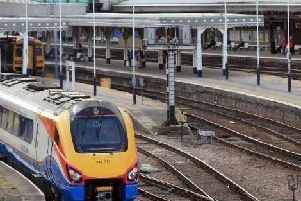 It crosses 17 railway lines including the East Coast main line. The naming has delighted the family of Sir Nigel Gresley, the railway engineer who designed the iconic loco, which entered service on March 3, 1938. Sir Nigel Gresley’s grandson Ben Godfrey said: “I am delighted to hear that Doncaster Council has decided to name the new bridge Mallard Bridge. “2013 is a very special year in the railway history of Doncaster because it is not only the 75th anniversary of the year that Mallard achieved the world speed record for steam traction but is also the 90th birthday of Flying Scotsman. The engine set the official speed record for a steam locomotive in July 1938, clocking up 126mph on July 1938. Mayor of Doncaster, Peter Davies, said: “Both the Mallard and the new bridge are examples of engineering at its finest. I am proud of Doncaster’s railway heritage and it is fitting to honour it with this scheme. Once complete the full road scheme is expected to improved road safety, ease congestion and reduce journey times for commuters along White Rose Way.